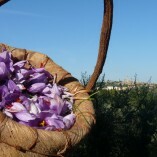 Saffron, a wonderful flower and its yellow treasure grown in San Gimignano | Tuscanyex | TUSCANY Experience - Excursions - Exploring - Expressions - Exclusive - Experts and so Exciting!! It is the end of October in San Gimignano and the countryside colors start turning to fall. Surprisingly, small squared pieces of land are purple, they are the flowers of a Crocus, hiding three precious red threads of saffron, one of the treasures making this city famous. The product has been Protected by Origin (DOP) since 2005, a good way to recognize its great quality value today, like in the past when this precious spice was object of trade and commerce, or money substitute as proved by many documents of the time. Here you meet a Sangimignanese (a native) producer, in his small family business, you will be part of the magic world of the Dop Saffron from San Gimignano. If the weather is good we join a farmer for the morning flowers picking. Around a kitchen table we enjoy a convivial tasting of saffron delicacies, while we separate the purple flowers from the three precious red threads, and dry them for a few minutes to make 1 gr. of Zafferano di San Gimignano Dop. We finish our experiece with a guided tour of the city themed to saffron.